Tabuik comes from the word `ark ‘, from the Arabic language which means to accompany. Tabuik ceremony is a tradition in the west coast, West Sumatra precisely in Pariaman, carried from generation to decrease. The ceremony is held on the day of the Asyura fall on 10 Muharram, in the Islamic calendar. History, brought about by the Tabuik Syiah of Pariaman to the middle east, as a war memorial Karbala. The ceremony was also as a symbol and expression of a deep sense of grief and respect, and Muslims in Pariaman grandson of the Prophet Muhammad SAW, named Husen killed by the Karbala. Agenda in the annual Pariaman this icon into one of the tourist area which was attended by thousands of people of indigenous, domestic and foreign tourists. In addition to the name of the ceremony, Tabuik also made to name objects that are important components in this ritual. Tabuik amounted to two and made of bamboo and wood. The form of animals are horses, human head, and a steady winged. By Muslims, this animal called Buraq, and is considered a magical beast. Tabuik in the back, made a post at about 15 m. Tabuik and decorated with red and other colors and will be in the wine later. There are two types of Tabuik the dilarung to high seas, the Tabuik pasa (Tabuik Market) and Tabuik Subarang (Tabuik across). The statue is not simply because the decoration through the rituals its making first. Procession ritual begins with the way this one Tabuik appointed by the bearer of the number reached 40 people. Behind Tabuik, berbusana group of people who bring traditional music instruments such as various perkusi drum, fill the succession line. During the procession takes place, all the carnival participants shout, “Hayya Hussain Hussain Hayya!” as an expression of respect to the grandson of the Prophet Muhammad SAW. Occasionally, procession stopped and dozens of people who typically play Silat Minang start off while accompanied tetabuhan. At sunset, procession was ended. Both Tabuik brought to the beach and next to the sea dilarung. This is done because there is belief that this throwing away of Tabuik to the sea, may dispose of bad luck. In addition, the moment this time also as a trusted Buraq fly to the sky, carrying all types of arakannya. Have a different nuance of the performance Tabuik now compared with ten years ago. Initially, Tabuik made by two groups of citizens from the citadel and then a different confronted one another. In the process, not infrequently followed by the scuffle with the residents of both the citadel. Now, the element of violence was found in the Tabuik has been removed. The ceremony is more directed to an interesting cultural attractions and can be consumed by the tourists. 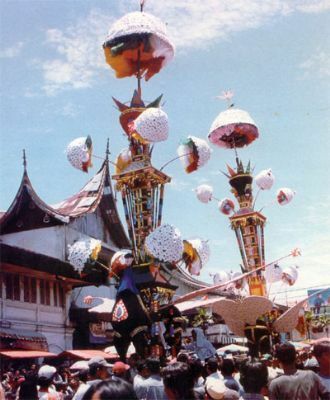 In addition to witness the procession of the ceremony Tabuik, the tourists can get around the traditional market and bazaar that was held in conjunction with this celebration. Enjoy also sala lauk and rakik maco, Pariaman the typical food sold along the many beaches.